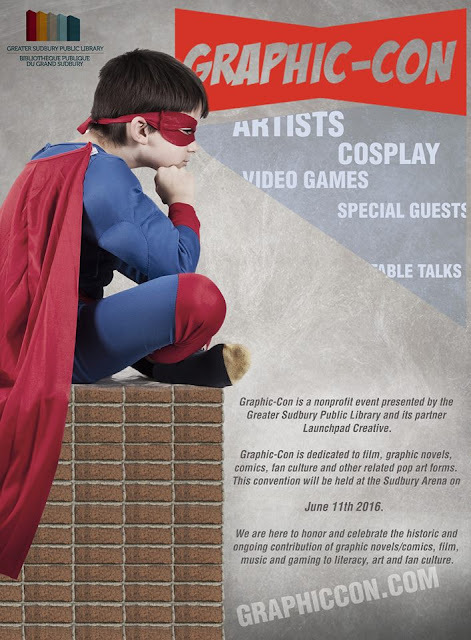 Comic convention season is upon us! I'm seeing pictures on social media of cons happening all over North America lately. My first comic convention of the year is in two weeks... eeek! This is Fan Expo's little brother of conventions. It's at the Toronto Convention Centre and I see a lot of repeat artists, vendors, and customers between this con and Fan Expo. I find it's the perfect first show to do of the year. It's not overwhelming but it's still filled with so much positive-geek energy. This is the second year for the Sudbury comic convention and I'm pretty excited for it. Last year's was super busy and it was awesome to do a local convention. This year it's taking over the Sudbury Arena so it has room to expand. The biggest convention of the year for me and I'm always super pumped for it. The size of this convention is definitely overwhelming but I love it. I think it's because I've been selling at this convention for a good 10 years. After I get over the first day jitters, I just take everything in all weekend and allow myself to get excited and hyped up in the environment. This is another local show that's heading into its second year. I sold at this show last year and it was fun. It will also be in a bigger venue so I'm looking forward to seeing how it turns out. Over the last few years I've cut out some shows and focused on the ones that I did really well at and also local ones. It's made a huge difference in my productivity. Spacing out my big shows allows me to sew up an insane amount of stock and I can keep my Etsy shop udpated (which has increased in sales). But you never know, I might decide to squeeze in some other local craft shows if they look interesting. I did sell at a great one last December at the local YMCA here which I'd love to do again. So as usual, be prepared for lots of craft and product pictures and updates! I hope you do great at all your cons!